The cars are all lined up, revving their engines, sending the RPM gauge into the red zone – ready to take off once the flags start waving. The driver of car 46, Jon Denning, takes out a small notecard as he waits for the go-signal and begins quietly uttering the Hebrew lyrics of the Traveler's Prayer: "May it be Your will, Lord, My God and God of my ancestors, to lead me, to direct my steps, and to support me in peace. Lead me in life, tranquil and serene, until I arrive at where I am going." Seconds later, the signal is given, Denning slams on the gas pedal and his adrenaline goes into overdrive as the race gets off to a start. Denning, a 20-year-old Jewish-American from New Jersey, stands out from the crowd of NASCAR drivers by virtue of his religious orientation. 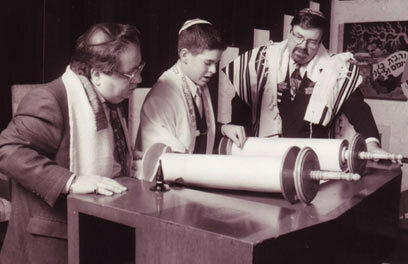 Although he doesn't label himself "religious," he is very proud of being Jewish and claims that his connection to Judaism is only becoming stronger with time. 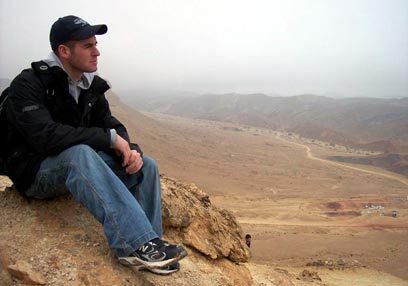 He recently participated on a Taglit trip to Israel which he said included several deeply spiritual moments. "Before we arrived to the Western Wall, our guide told us about the place and showed us the picture of the soldiers that conquered the square during the Six Day War," he recounts in a conversation with Ynet. "Afterwards, we approached the Wall and I laid tefillin and prayed. It was an extraordinary experience. "I'm not a spiritual person by nature, but I nevertheless felt a strong spiritual presence there that I have never felt before. It's hard to explain but it just took me over – I'll never forget what it was like." NASCAR racing has become very popular in the American South, which is mostly inhabited by devout evangelical Christians. Denning is the only Jewish driver in the competitions. For the past three years, Denning has left his home in New Jersey during the NASCAR season, which lasts from March to November, to go to Virginia in order to compete. Denning says he isn't ashamed of his religious identity and doesn't hide it from fellow drivers – but it often makes him feel like an outsider. The Jewish racer says he has never been subjected to overt anti-Semitism, although he is quite aware that prejudice often lurks just below the surface of some of his relationships with other NASCAR drivers. "No one would every outwardly express any prejudice towards me because it would look really bad," Denning explains. "But slowly, once you get to know people, you suddenly discover another side to them. Sometime people will let loose an unacceptable pejorative term or just denigrate the Jews without knowing that they are standing in front of one." Denning says people in the sport have tried to convert him saying he would have better luck if he believed in Jesus Christ. But, "I'm a Jew and I will remain a Jew," Denning proclaims. "I try to gently respond to those who try to convert me and change subject. They don’t' always understand that they're doing something that is not OK -- aggressive. They think they're doing a good thing." Last year, Denning finished first in four out of 20 of the NASCAR races he took part in. In the majority of 16 races he didn't win, he finished in the top ten. Despite this decent record, he was unable to qualify for the highest level of races. Denning is hoping for a more successful record this season. Despite the dangers inherent to the sport, he says he feels protected by the Traveler's Prayer he recites before every race. The National Association for Stock Car Auto Racing (NASCAR) is the largest sanctioning body of motorsports in the United States. With roots as regional entertainment in the Southeastern US, NASCAR has grown to become the second-most popular professional sport in terms of television ratings inside the US, ranking behind only the National Football League. See all talkbacks "Jewish American race car driver talks about his faith"